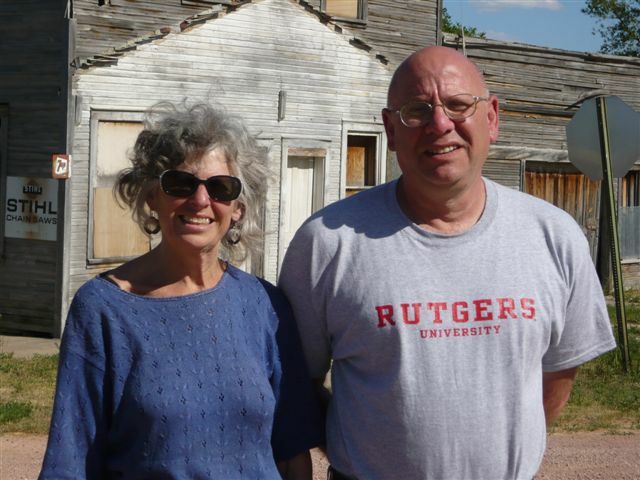 I originally published this interview on April 14, 2010, but the concepts it explores are just as relevant today, especially if you're wondering what shrinking cities like Flint have in common with remote grazing land in Colorado. Frank J. Popper is just the person to answer that question. The land-use expert from Chicago is a professor at Rutger’s Edward J. Bloustein School of Planning and Public Policy and teaches regularly in the Environmental Studies Program at Princeton. In 1987 he published an article with his wife, Deborah Popper, a geographer at City University of New York and Princeton University, advocating the creation of what they called the Buffalo Commons. They argued that using the drier portions of the Great Plains for farming and ranching was unsustainable, leading to environmental damage and a dwindling population. Instead, they suggested returning 139,000 square miles of the Great Plains to native prairie where the buffalo could, once again, roam. In short, they wanted to turn parts of ten western states into a vast nature preserve. Nicholas Kristof of The New York Times called it “the boldest idea in America today…the biggest step to redefine America since the Alaska purchase.” The locals in states like Kansas, Montana and Nebraska were less enthused. In an interview with Flint Expatriates, Popper discusses death threats, the links between deindustrialization and agricultural decline, the fate of shrinking cities, and the heartless genius of capitalism. What was the response to the Buffalo Commons idea? It was extremely negative in the region. Everyone else from outside the region thought it was a great idea. There was a period in the early nineties when we were speaking in the plains five times a year and sooner or later it would emerge that they had hired private detectives to protect us. We had death threats at one meeting that eventually had to be cancelled. If your county is suggested as part of the Buffalo Commons, you’re not going to like it very much. Have conditions in the Great Plains changed over the years? The basic conditions that we described in 1987 are either still there or have intensified. But late last year we picked up our first serious editorial endorsement. Two McClatchy papers in Kansas City and Wichita suggested that two counties in western Kansas should become the core of Buffalo Commons National Park, and that elicited a lot of letters from those two counties. But I think over time it will work and we will live to see it. The emerging ideas about how to deal with shrinking cities like Flint echo a lot of your recommendations from the eighties about how to approach the Great Plains. What’s the connection? It’s very clear that the industrial decline as it’s still unfolding is almost exactly parallel to the earlier rural decline in the United States. In rural areas, agriculture reached a high point in the late 19th century, and then it started going through a kind of slow motion collapse that the country largely didn’t realize until the dust bowl of the depression. In the 20th century, the industrial sector likewise hits its high point and then started shedding people, only it happened in more urban places like Detroit. The U.S. had these two great cycles play out. And there is the beginning of an argument that the dotcom bust, the mortgage foreclosure crisis and the credit crunch that has now hit a number of sunbelt cities really hard indicates that the information age is beginning to shed people, too. And it’s a largely suburban phenomena so you have a trifecta of decline — rural agricultural, urban industrial, and suburban information age. Why are cities and regions so reluctant to accept that they are getting smaller? It’s part of American culture to believe were number one, we grow every year etc., etc. So all of this — whether its Buffalo Commons or shrinking cities — feels very un-American. A lot of people ended up describing Buffalo Commons as manifest destiny in reverse, which kind of makes sense. Shrinking cities could be described as unbuilding cities that all those late 19th-centrury, early 20th-century industrialists and laborers sought to build up. And that hurts for their descendants down the line. It also comes with another sort of sting. Good blue-collar jobs that promised upward mobility have just disappeared. How does America’s approach shrinking cities compare to the rest of the world? Do shrinking cities have any advantages over agricultural regions as they face declining populations? 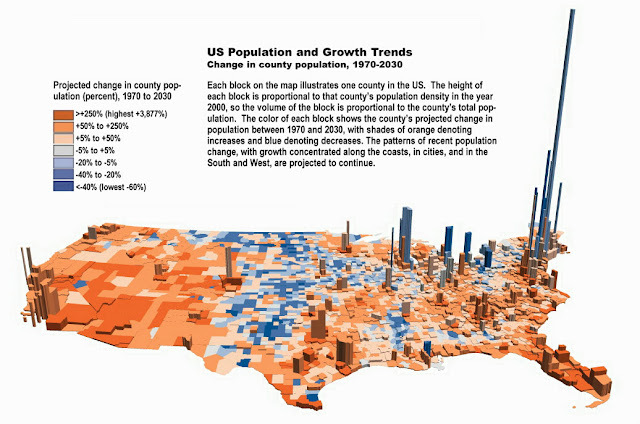 The urban areas have this huge advantage over all these larger American regions that are going through this. They have actual governments with real jurisdiction. Corrupt as Detroit or Philadelphia or Camden may be, they have actual governments that are supposed to be in charge of them. Who’s in charge of western Kansas? Who’s in charge of the Great Plains? Who is in charge of the lower Mississippi Delta or central Appalachia? All they’ve got are these distant federal agencies whose past performance is not exactly encouraging. Why wasn’t there a greater outcry as the agricultural economy and the industrial economy collapsed? One reason for the rest of the country not to care is that there’s no shortage of the consumer goods that these places once produced. All this decline of agriculture doesn’t mean we’re running out of food. We’ve got food coming out of our ears. Likewise, Flint has suffered through all this, but it’s not like it’s hard to buy a car in this country. It’s not as if Flint can behave like a child and say “I’m going to hold my nose and stop you from getting cars until you do the right thing.” Flint died and you can get zero A.P.R. financing. Western Kansas is on its last legs and, gee, cereal is cheaper than ever. In some sense that’s the genius of capitalism — it’s heartless. But if you look at the local results and the cultural results and the environmental results you shake your head. But I don’t see America getting away from what I would call a little sarcastically the “wisdom” of the market. I don’t think it’s going to change. So is there any large-scale economic fallout from these monumental changes? Probably not, and it hurts to say so. And the only way I can feel good about saying that is to immediately point to the non-economic losses, the cultural losses. The losses of ways of life. The notion of the factory worker working for his or her children. The notion of the farmer working to build up the country and supply the rest of the world with food. We’re losing distinctive ways of life. When we lose that we lose something important, but it’s not like The Wall Street Journal cares. And I feel uncomfortable saying that. From a purely economic point of view, it’s just the price of getting more efficient. It’s a classic example of Schumpeter’s theory of creative destruction, which is no fun if you’re on the destruction end. Does the decline of cities like Flint mirror the death of the middle class in the United States? I think it’s more the decline of the lower-middle class in the United States. Even when those jobs in the auto factories paid very high wages they were still for socially lower-middle-class people. I think there was always the notion in immigrant families and working-class families who worked in those situations that the current generation would work hard so that the children could go off and not have to do those kind of jobs. And when those jobs paid well that was a perfectly reasonable ambition. It’s the cutting off of that ambition that really hurts now. The same thing has been true on farms and ranches in rural parts of the united states. The basic premise of shrinking cities resonates with a lot of people, but there’s not a lot detail in the plan. Is this a concern? The shrinking city approach is really the core of what’s needed to improve these places. I guess what I see is an emerging movement that’s improvising every step of the way, often under extreme political pressure. My sense is that it’s sort of like Boris Yeltsin in the ‘90s, making it up as he goes along because he has no other options. That’s not meant as a criticism at all. Cities like Flint and Detroit have gotten so desperate that a lot of policy Hail Mary’s are necessary. And it’s hard in an era of budget shortfalls, but part of the process will be figuring out what does and doesn’t work. The shrinking city [concept] is sufficiently new that things will be discovered on the fly. And this is not uncommon. My impression is that that’s how the Civil War was fought; that’s how the New Deal was created. It’s how NASA operated in the 1960s, which is thought of as a sort of golden age. This is not an unusual situation. What about the prospect of a single business or industry moving into a shrinking city and reviving it? In none of these cities — including the Southern and European ones — is there any hope whatsoever of a serious new industry coming. I think I can say that categorically. Will relocating residents to a more viable central urban core work? When you’re talking about many of these neighborhoods, you’re talking about really poor people who are not likely to move. We’ve tried this at different times and different places in this country, and I don’t think any of them were shining points in American history. It evokes all that 1950s urban renewal stuff which didn’t work, but we keep trying to do anyway. More likely is that you’ll get this reversion to a more rural feel to parts of the city, maybe even a suburban feel. That could provide some form of stability for the city. It could even be a retirement option for some people. Care to make a prediction of how this approach will play out in cities like Flint? I think a few neighborhoods will benefit and things will turn around precisely because the upside of the shrinking city plan — the green economics, the growth of small retail — will work. But the really poor places, the worst neighborhoods, they’ve got real problems, as they always have. I would worry about the really poor ones. I don’t know what will happen to places like that, and I’m not of good conscience about it. This is the second in a series of interviews with urban planners and land-use experts. Go here to read the Flint Expatriates interview with Terry Schwarz, interim director of the Cleveland Urban Design Collaborative at Kent State University. Good Analysis. The end result of Capitalism working itself out is what will happen and has been successful when left alone without too much government involvement. One city will lose and another will win. I look at Flint as similar to Greece. GM paid out extras that they could not afford in the first place and it finally caught up to the more current shop workers and Flint in general. Just like nobody really wants anything to do with Greece, businesses don’t want anything to do with Flint. It’s to bad. I would have loved to live my whole life there. These articles/interviews are significant intellectual contributions, and need to be maximally searchable. Maybe you should add "urban planning" and "land use expert" tags. JWilly, just added some more tags to help with searches. I've got one more Q & A to complete the first series. One interesting thing so far is the vast gulf between the broad outlines of the shrinking city plan you see in the media and the particulars you get when you talk to the experts. 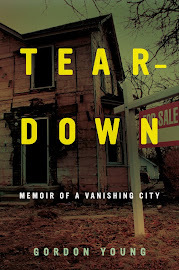 The tearing down houses part seems easy compared to the prospect of moving people around and eliminating infrastructure. Yeah, I agree with JWilly--this is a valuable addition to the discussion and possible solution(s). Thanks for sharing, Gordie. Very briefly, Schumpeter's "Creative Destruction" assumes that the benign outcomes of change will eventually outweigh the malign outcomes of change. This is an article of faith, not fact. "Creative Destruction" played out on the edge of a tipping point can go a number of different ways, not all of them benign. There is no guarantee that any one at all must win. This "theory" is more like an illustration accompanying a photo of Baldwin Steam Locomotive next to a diesel locomotive: it is a caption, and not a theory. A further useful contribution might be made by one or more interviews with Michigan-sociolegal expertise relevant to contracting the boundaries of a city, providing some areas of a city with fewer live services than others, decommissioning or removing infrastructure or creating a two-zone system regarding maintenance and operational expenditures, and other possible courses of action that might be part of a "shrinking" plan, but that might conflict with citizens' rights and reasonable civil expectations in regard to usability of private property and thus amount to a taking of its value. I really liked the interview. Though I think that some of the language used was not as straightforwardly honest as it could be, especially with regard to the notion of industrial and agricultural decline. Agriculture has not declined, it has become more productive and employs far fewer people. Also manufacturing has not declined, it too has become far more productive and employs somewhat fewer people. For a fact, manufacturing output in the USA is at an historical high and manufacturing is growing in the South and in big cities too, like Houston. Thus manufacturing hasn't declined, it has become more productive and shifted locales to places where the political and economic climate favor it and away from places where it is no longer favorable like Flint and Cleveland. I think that the graph is dishonest in its presentation. The population of the USA was 203 million in 1970, the population will be at least 330 million in 2030. Those 130 million extra people have to go somewhere. Nearly all metropolitan areas will experience some growth. The graph gives the opposite impression. Popper is not defining agriculture and industrial manufacturing simply by output, he's also including employment, which is the common way to discuss an industry or economic sector. Claiming that industrial manufacturing and the agriculture sector are just dandy because output has increased ignores the huge impact the loss of employment in those areas had on the United States, unless what happened to places like Flint, Youngstown, Pittsburgh, St. Louis, Gary, Detroit and dozens of other cities doesn't bother you. Craigslist has been a hugely productive enterprise. It eliminated the need for paid classified ads, which put large numbers of people out of work. It employs less than 20 people. If we could just replicate that worldwide, we'd have a very efficient, productive economy. Except we'd have a 70 percent unemployment rate. That sounds like something you'd like. Likewise, simply saying, oh well, the economic climate is better in places where workers will work for peanuts, too bad for Flint and Detroit, is a ridiculously simplistic way to breakdown a very complex problem. Economic policy made it possible for it to happen, not some magical market force. Get real. Finally, just because the overall world population is rising doesn't mean than hundreds of cities or regions around the world aren't shrinking. The orange sections on the map are growing. The blue sections are shrinking. Why's that so tough to understand. I didn't disagree that manufacturing employment is down. I disagree with the analysis that a decline in employment equals a decline in an industry. The problem with the graphic is one of scale. The scale employed to graph the declines is an order of magnitude greater than the scale used to graph the increases. If the same scale were used throughout, the orange towers would dominate the graph and the blue would be nearly invisible save a blue dot or two around the great lakes and northern New Jersey. Click on the graphic and read it. It's not trying to convey what you think it is. And I'd disagree that a decline in employment doesn't equal a decline in an industry, unless the you only judge an industry by corporate profits. A society only becomes wealthier when the unit output per worker rises, that is workers are more productive. Companies must earn a profit; that is, income must exceed expense; or the business stops functioning. Regarding the graphic, I wasn't commenting on the scale for density, I was commenting on the scale used for changes in population. He uses only three shades to denote growth from plus five to plus 250. He uses only a single color to mark growth from plus five to plus forty. Compare that to the use of four shades to mark declines from minus five to minus forty. The shading exaggerates the declines. 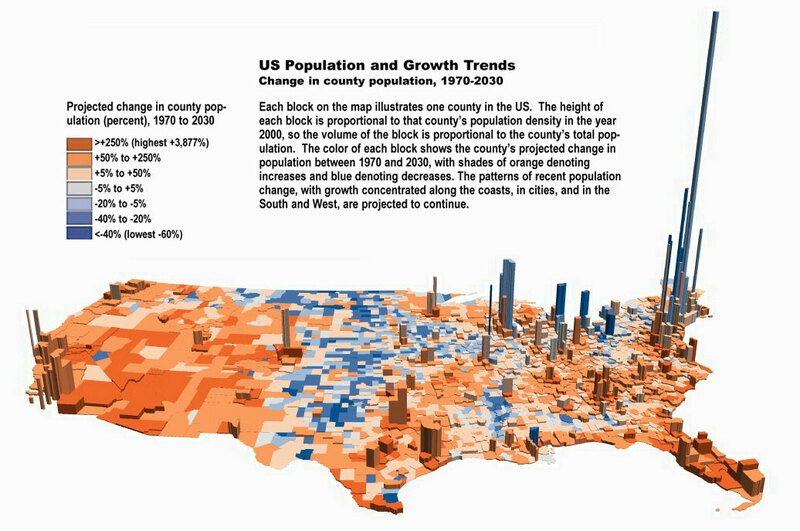 Though the shading also elucidates the fact that the declines occur in the areas with the greatest human density, perhaps a testament that people prefer less density to more density in the built environment. Sociologists have commented over the years on the differences between a society with a small middle class, perhaps made up of shopkeepers and skilled service providers, in between a large, poor working class and a small, rich ruling/resource-owning class; and a society in which a significant number of nominally working-class jobs create enough value that those workers effectively become part of a very much larger middle class. Flint of course once was the textbook example of the latter. Most of the textbook examples of the former are set in the third world, with the rich living in walled, guarded compounds and the police force focused primarily on protecting the rich from the poor, not everyone from the criminals. One has to wonder whether the changes to American manufacturing will have a happy outcome for American society, if the number of high-value-creation working class jobs can be expected to continue to shrink even as the value creation of the associated manufacturing remains high. In a society with a much smaller middle class, who will be the mass consumers of the products resulting from that manufacturing? I wish our national leaders would talk to us about strategic issues like this, and propose how the nation will adjust. Preparing for the future, and perhaps shaping it to the extent feasible, seems to me to be a worthy function of government. But, our recent governments seem to be much more focused on the present, and perhaps the near future out to the next election.